Jonathan Jackson has a very rare form of a rare neurological condition. He has synesthesia, which is a cross-connection of two (or more) unrelated senses where an perception in one sense causes an automatic experience in another sense. Some synesthetes, for instance, see various sounds or musical notes as distinct colors (chromesthesia), others perceive different words as distinct tastes (lexical-gustatory synesthesia). Jackson, on the other hand, experiences his thoughts as shapes in a visual mindmap. This is so fascinating I’ve excerpted a short piece of his story below. Also, if you are further intrigued by this subject I recommend three great reads on the subject: Wednesday Is Indigo Blue: Discovering the Brain of Synesthesia by Richard Cytowic, and David M. Eagleman; Musicophilia: Tales of Music and the Brain, by Oliver Sacks; The Man Who Tasted Shapes by Richard Cytowic. 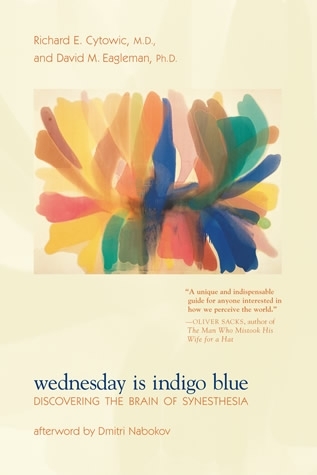 Image: Wednesday Is Indigo Blue, bookcover, Courtesy: By Richard E. Cytowic and David M. Eagleman, MIT Press.